Additionally, if you are a patient who was taking Vioxx, you may click here to download a refund form. Merck is voluntarily pulling its non steroidal anti-inflamatory drug (NSAID) Vioxx from the market due to concerns that it puts patients at an increased risk of heart attack and stroke. This increased risk of stroke and heart attack has been shown by a number of studies, but Merck reports that its decision to pull the drug is based on the results of the APPROVe (Adenomatous Polyp Prevention on VIOXX) trial. The purpose of this trial was to determine if Vioxx was effective at preventing the recurrence of polyps in patients with a history of colorectal adenomas. According to Merck, the study showed "an increased relative risk for confirmed cardiovascular events, such as heart attack and stroke, beginning after 18 months of treatment in the patients taking VIOXX compared to those taking placebo." It seems particularly interesting that the risk showed up only after 18 months of treatment. 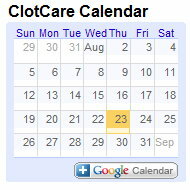 In a recent ClotCare posting, Henry I. Bussey, Pharm.D. reviewed a study that showed an increased risk of heart attack with Vioxx that was evident within the first 30 days of Vioxx therapy and over 30 to 90 days of therapy. This study found that after 90 days, there was no increased risk of heart attack with Vioxx. Click here to read the ClotCare posting entitled Vioxx (rofecoxib), but not Celebrex (celecoxib), Significantly Increases the Risk of Heart Attack. This story has been reported by all major news agencies today. Below are links to the story as told by a number of different reporters. Merck's release provides more detail concerning the clinical trial, while the news agencies tend to focus more on the financial implications of this decision. Are you a patient who was taking Vioxx before it was discontinued? Click here to download instructions on obtaining a refund.